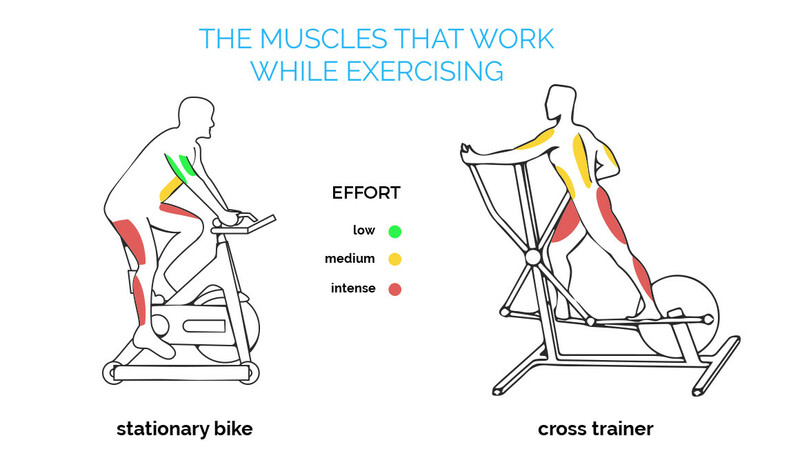 What Muscles does a Stationary Bike Work? The exercise bike offers a great cardio workout that is generally soft and smooth but it can also be very demanding, especially when the pedaling resistance is set at a very high level, and then have a significant effect on your calves and leg muscles, thighs and buttocks. In addition, cycling gives you well refined muscles since riding on a stationary bike involves a steady effort without jerks. It is therefore ideal if you want to lose weight, tone your legs and get a lean body. 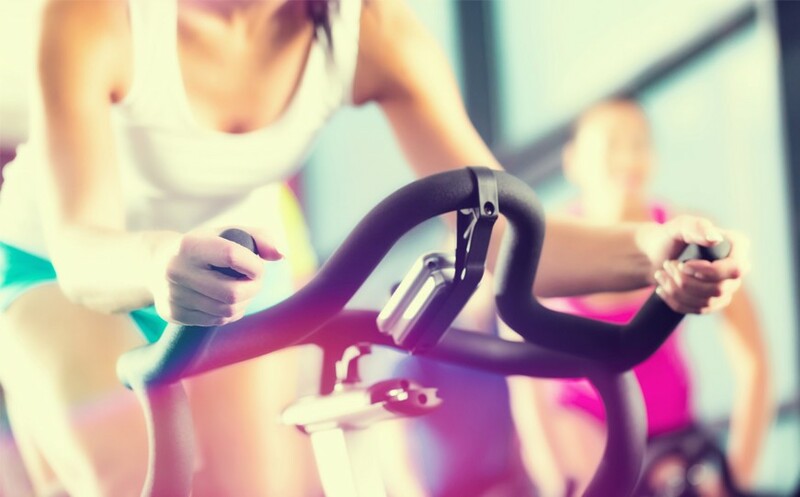 We will explain to you what muscles work on a stationary bike and which workout routines are more effective to build muscle and burn calories. 1. What muscles does the exercise bike target? 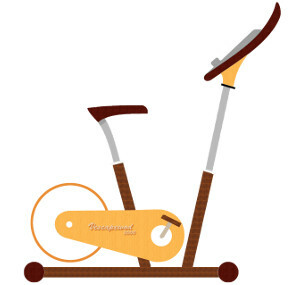 First and foremost, the exercise bike works out the most important of all muscles, namely your heart! Riding a stationary bike also has many health benefits, increases your endurance and stamina, and is an ideal sport to lose weight. The exercise bike can help you build muscle and target specific parts of your body, which is essential if you want to refine your body. 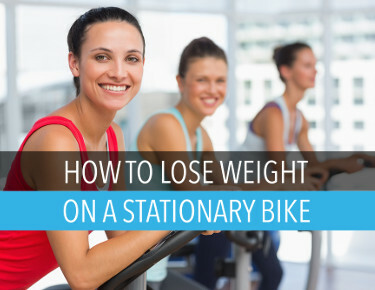 The advantage with the stationary bike is that you can choose and modulate how much you want to work your muscles. The more you increase the pedaling resistance of your bike, the more you work your muscles and develop your muscle mass. Besides the heart, the muscles targeted by the stationary bike are first the leg and thigh muscles as well as the buttocks (or glutes) and then the abdominals and back muscles. - the quadriceps and the harmstrings, muscles of the front and the back of the thigh, are constantly working while you are pedaling. - the gluteal muscles or glutes (large, medium and small buttocks), also called glutes, are also working out when you are pushing the pedals. - the calf muscles, called triceps sural, located at the back of the leg. The muscles of the lower limb (in red on the diagram) are mostly working while you are exercising on your stationary bike. The muscles of the upper limb are also working, though to a lesser extent than your legs, thighs, calves and buttocks. - The abdominal muscles or abs ensure the posture and the balance of the pelvis and the spine. - the back muscles, the quadratus lumborum muscle and iliopsoas (in yellow on the diagram), also help to maintain your position and support the spine. - The biceps and triceps, muscles from the front and back of the arms, allow you to hold the handlebars. The arm muscles (in green on the diagram) work more when you tighten the handlebars, especially when sprinting, or when you are riding out of the saddle with high resistance. When you are pedaling out of the saddle with high resistance, you put more pressure on your arm muscles (biceps and triceps) and on the muscles of the lower back while your thigh muscles (quadriceps) and your buttocks work less because you are using the weight of your whole body to cycle and thus your legs have less effort to provide. Make sure you have a good position on your exercise bike and you set the saddle at the right height in order to avoid any problem, tendinitis or muscle pain. WHAT YOU SHOULD KNOW: Your muscles need resistance to work! The more you increase the pedaling resistance of your exercise bike, the more strength you need to provide and the more you work your muscles. On the contrary, if the pedaling resistance is too low, you will hardly increase your muscle mass. 2. How long does it take to build muscle on the stationary bike? You are not going to have beautiful thin legs or the perfect buttocks overnight without effort! For that, you need to workout regularly and be constant. You'll see the results after a few weeks. Be patient and persistent and you will see the effect of the exercise bike on your body. If you want to track the evolution of your muscle mass, you can do it with a body fat scale. In general, you should start seeing the first effects after a few weeks, about 4 to 6 weeks. Your legs, thighs and buttocks are more firm. And your workout should also feel easier and less demanding after 4 to 6 weeks than it was at the very beginning. After 6 weeks, continue working out at this pace and eventually increase the duration and intensity of your exercises, not too much though because doing too much could have a negative impact on your motivation. Does the exercise bike make your legs and thighs bigger? Don't worry: cycling regularly will not make your legs or your thighs fatter! The exercise bike offers a cardio workout (cardio training) that will tone and refine your legs, thighs and buttocks. If you want to increase the volume of your muscles, then you will have to combine regular training on an exercise bike for 1 hour every day or even more at a very high resistance level with weight training to build muscle. Moreover, the results are (unfortunately) not coming overnight ... you must persevere ;). It all depends on your goal: lose weight (and fat) and tone your muscles or gain muscle mass and volume? 2. To muscle your legs and thighs, you can focus almost exclusively on HIIT training with high increases in the pedaling resistance of the bike. For example, you can do 3 to 5 HIIT workouts per week for 20 to 30 minutes.